The main purpose of the event was to support the capacities of the National Societies in the OIC region, and ensure through collective efforts the provision of legally, programmatically and financially supportive environment for the humanitarian activities. During the first day of the event, SESRIC shared with the participants the status of man-made and natural disasters and their effects in the OIC region. 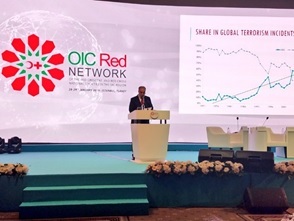 Following this event, the Turkish Red Crescent will host the 4th Consultative Meeting between the Islamic Committee of the International Crescent (ICIC) and Red Crescent/Red Cross National Societies of OIC countries, the ICIC International Humanitarian Law Seminar and the 33rd Official Committee Meeting of the ICIC on 30-31 January 2019.